SkyDive Kansas got the jump on the final days of summer with a weekend of training, tandems and top jumpers. 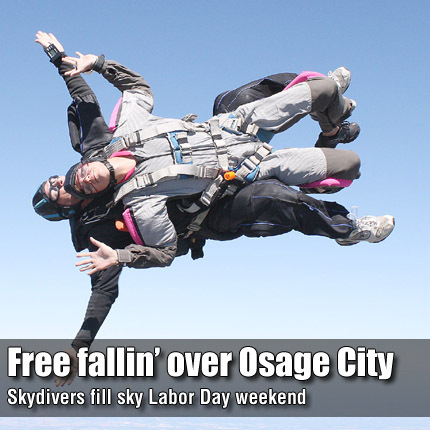 Skydivers jumped three of the four days over the Labor Day weekend, with no jumping Sunday due to high winds. Guests for the weekend included Tom Noonan, who took part in the first tandem jump off Mount Everest. The guest list also included Emiko Pray, who brought an additional plane, allowing jumpers to clear the usual ceiling of 10,000 feet by an additional 3,000 for extended free fall. SkyDive Kansas owner Jen Sharp also conducted an all-female tandem instructor certification over the weekend.